should not be occurring under standard assumptions of astronomers. New images of the clustered galaxies of Stephan's Quintet suggest interactions that should not be taking place. Astronomers have long assumed that one of the galaxies is far too close to us to physically interact with the more "remote" members of the group. 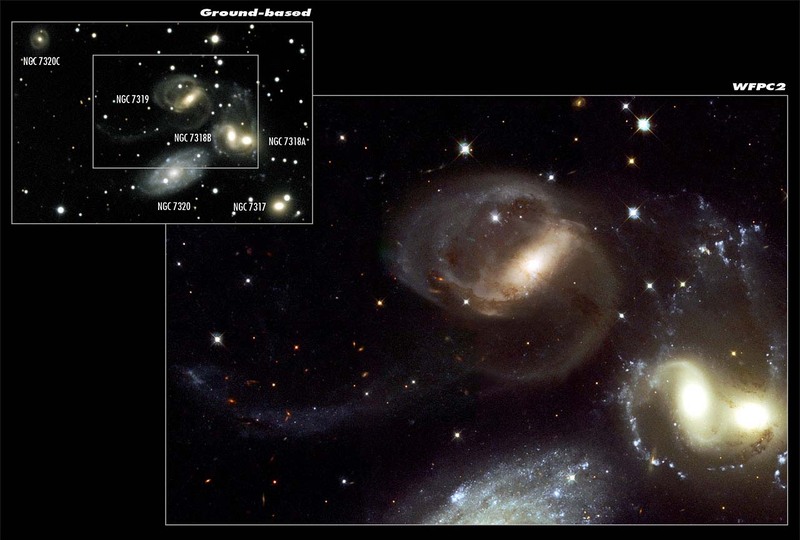 Stephan's Quintet is a famous group of five galaxies discovered by Edouard Stephan in 1877 at Marseille Observatory. Because the group is tangled in filaments of matter from each other, astronomers assumed they were near each other and were interacting. (For orientation, see the overlay of ground-based and Hubble Space Telescope images here.) The cluster sparked a controversy in the '60s when Geoffrey and Margaret Burbridge obtained spectra of the constituent galaxies. The galaxies' shift toward red on the spectrum suggested (based on expanding-universe assumptions) that all but one are receding from Earth at about the same velocity (~6000 km/s). The 'discordant' galaxy (NGC 7320) is centered at the bottom of the Hubble image. Its redshift suggests it is receding much less rapidly (~800 km/s) and therefore must be considerably closer to us. Astronomers such as the Burbidges and Halton Arp argued that the discordant redshift of this galaxy invalidates the cornerstone of Big Bang and expanding-universe cosmology: the assumption that redshift gives a reliable basis for calculating velocity and deducing present distance. For many years the issue was downplayed, but the contradictions couldn't be resolved. Then, in the year 2000, based on images from the Hubble space telescope, expanding-universe astronomers claimed individual stars could only be seen in the 'close' galaxy, NGC 7320, thereby proving that NGC 7320 lay in front of the four interacting background galaxies. But this was not the end of the story. As can be seen in the Hubble image (linked above), the 'close' galaxy does indeed show more details than the cores of the other members of the group. But it is also apparent that the resolution of NGC 7320 and the interaction debris encircling the 'background galaxies' NGC 7318A and B reveal comparable levels of detail and 'clumpiness'. This would argue strongly in favor of the galaxies being sufficiently close to interact. One of the most remarkable aspects of Stephan’s Quintet is the long non-thermal radio-continuum structure lying in intergalactic space between the galaxies. It is also visible in X-rays and UV, and recently it was imaged in infrared by the Spitzer telescope and H-alpha emission. The picture above is a composite. 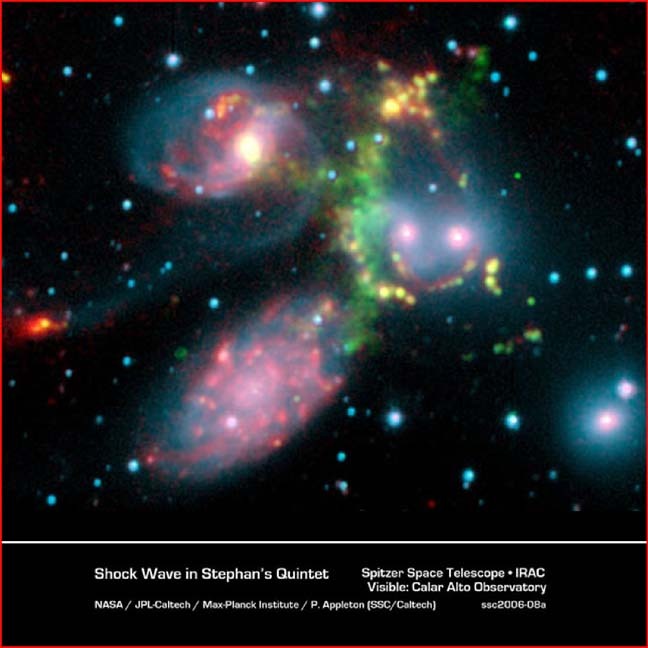 It clearly shows the giant arc-like 'shock wave' (in green from H-alpha emission) that astronomers interpret as the effect of a collision between NGC 7318B and the rest of the group. Of course, 'shock wave' is not the language that would be used by plasma cosmologists or proponents of the Electric Universe. The tantalizing image is the result of work by a team of scientists from USA, Germany, and Australia, utilizing the super-sensitive infrared spectrograph of the Spitzer Space Telescope. It detects the abundance of excited hydrogen molecules emitting a distinctive type of radiation that can be detected in the infrared. In standard cosmology, astronomers will resort to the concept of mechanical shock to account for this excitement of hydrogen in space; plasma cosmologists believe that electrical interactions are a far more efficient explanation. The filamentary and 'dotted' structure indicates Birkeland currents and electrical activity, as does the 'synchrotron' (non-thermal) radiation from charged particles confined by magnetic fields and moving at velocities close to the speed of light. 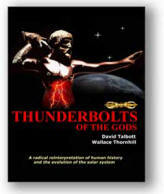 Electric discharge is known to be the efficient means of producing such energies. "The strength of the emission and the fact that it shows the gas to be highly disturbed was a huge surprise to us", said team leader Dr. Phil Appleton. "We expected to see the spectral signature of dust grains — but instead we saw an almost pure laboratory-like spectrum of hydrogen molecules and almost nothing else. It was quite unlike anything we had seen before in a galaxy system". What is obvious from this image is that if the 'shock wave' means dynamic interaction, then there are connections between the supposed 'intruder', NGC 7318B, (upper right), and both NGC 7319 (center left) and NGC 7320 (lower left). But the supposed distance of NGC 7320 from the others, based on assumptions about redshift, would preclude such interactions. The 'mashed together' pair, NGC 7318A and B, which even conventional astronomers admit are interacting, are themselves a 'discordant group'. B, on the left, has a redshift velocity 1000 km/s lower than A. The redshift-equals-distance assumption would place it in front of its neighbor and safely out of interaction's way. It is also worth noting that the galaxy NGC 7319 (upper left in the image above) is the location of one of the most shocking challenges to the standard view of redshift. In front of the galaxy's dense core lies a quasar, an object whose redshift implies it should be more than 90 times farther away from us than the big galaxy behind it. See Picture of the Day here. What does all this mean? If the measuring stick (standard interpretation of redshift) is flawed, so are the measurements and deductions that follow. And to one degree or another that includes almost all the themes of standard cosmology today. The redshift controversy is still very much alive.